6 Wedding Cakes we have made recently, all have Sugar paste or fresh flowers as part of their design. 4 Tier round, bottom tier covered in sugar paste petals. 2nd tier plain pale pink. 3rd tier white with piped detail. 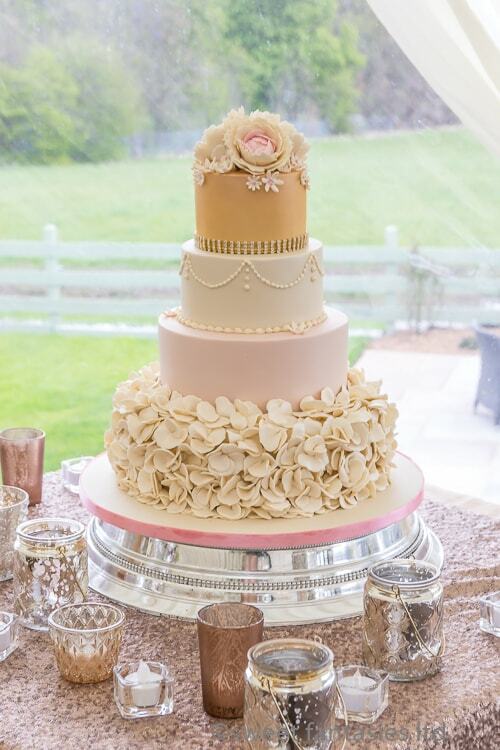 Top tier gold with handmade sugar paste Peonies and small filler flowers. Cake Flavours:- Bottom Tier Vanilla Sponge, Raspberry Jam & Buttercream, 2nd Tier Chocolate with Chocolate Ganache Buttercream, 3rd Tier Fruit Cake and Top Tier Carrot Cake with Cream Cheese Frosting filling. A similar design to No. 1, 4 Tier round, again with sugar paste petals on bottom tier. 2nd tier is silver with a nice shiny finish. 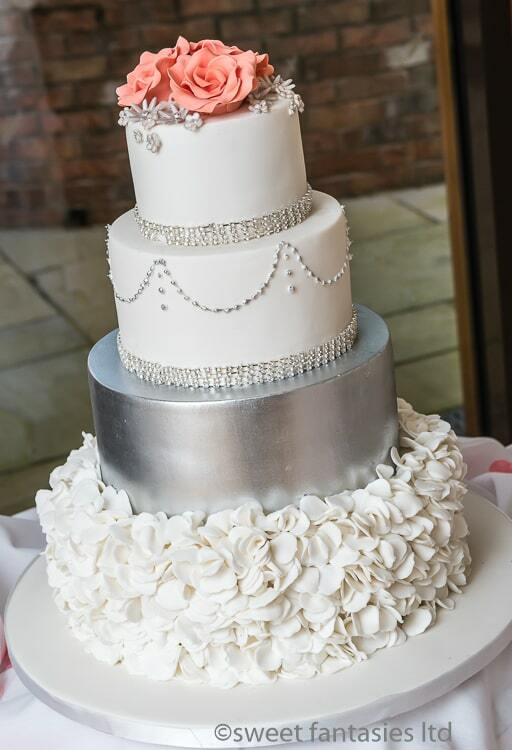 Top tier is white with Silver Diamante banding topped with Coral Sugar Paste roses. Cake Flavours:- Bottom, 2nd & 3rd Tiers Vanilla Sponge, Raspberry Jam & Buttercream, Top Tier Fruit. Cake Flavours:- All 4 Tiers Vanilla Sponge & Buttercream. 5 Tier round white wedding cake, each tier was also dusted with glitter. Then between each tier fresh Roses & silk Hydrangea & filler flowers were added. Cake Flavours:- Bottom Tier Vanilla Spong, Raspberry Jame & Buttercream, 2nd Tier – Chocolate Sponge with Chocolate Ganache Buttercream, 3rd Tier – Chocolate & Orange Sponge with Vanilla Buttercream, 4Tier – Lemon Sponge, Lemon Curd & Vanilla Buttercream, Top Tier – Carrot Cake with Cream Cheese Frosting. 4 Tier round with a ruffle design on the bottom tier. 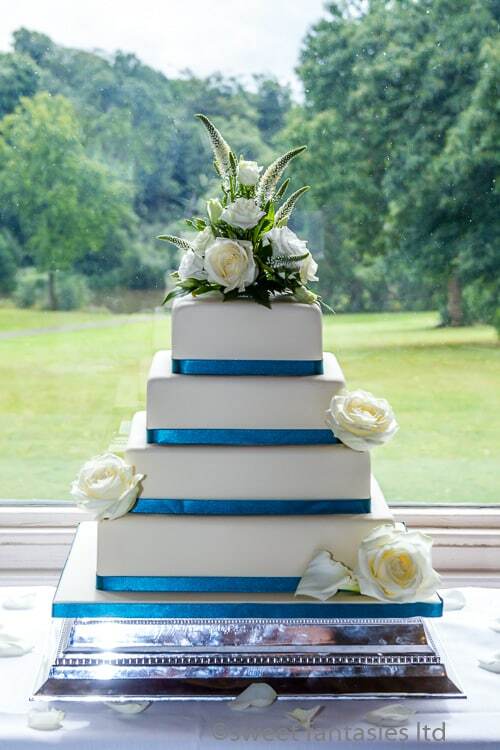 2nd tier as a piped royal icing flower pattern with silver centres. 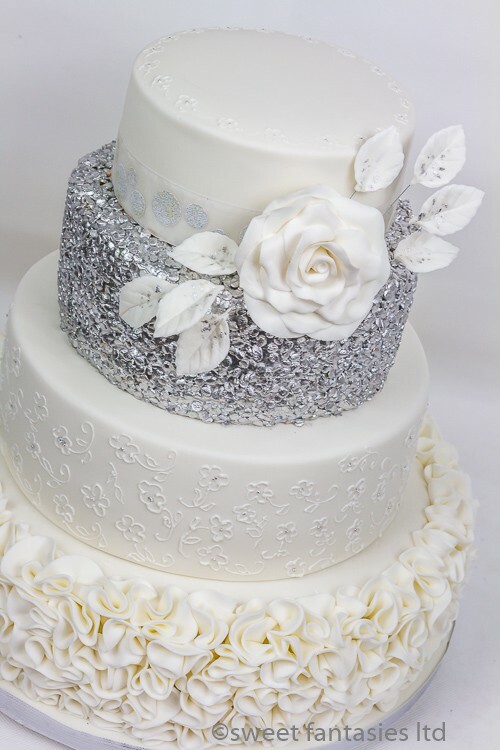 3rd tier is covered in silver confetti and the top tier is plain white with a silver spotted ribbon. Then a Hand made sugar paste rose & leaves with silver highlights placed on 3rd tier. Cake Flavours:- Bottom Tier – Chocolate Orange Sponge & Vanilla Buttercream, 2nd & 3rd Tier – vanilla Sponge, Raspberry Jam & Buttercream, 4th Tier Chocolate Sponge with Chocolate Ganache Buttercream. 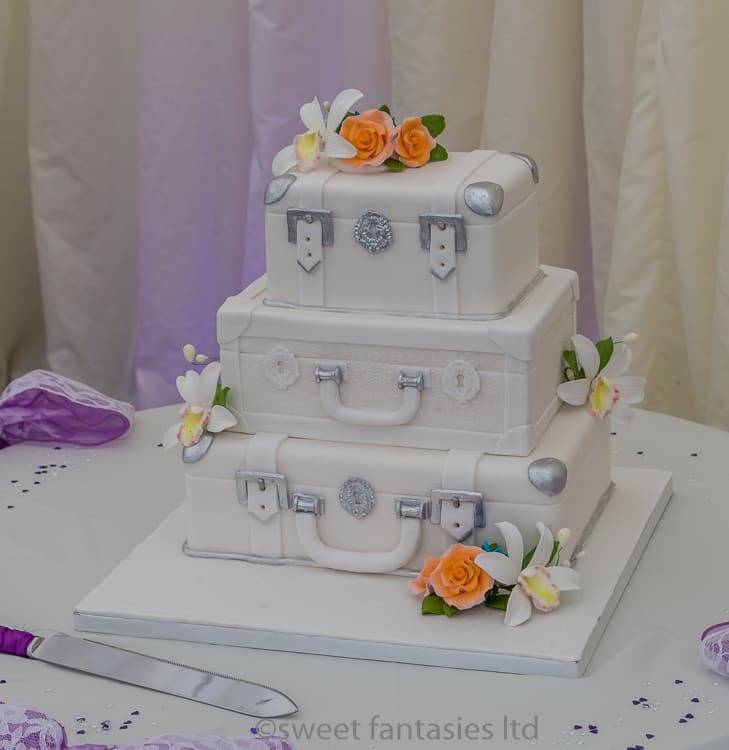 3 Tier Suit Case design in white with silver trim, with Orchid & Rose, sprays on board and top tier and Orchid and filler flowers on the 2nd tier. 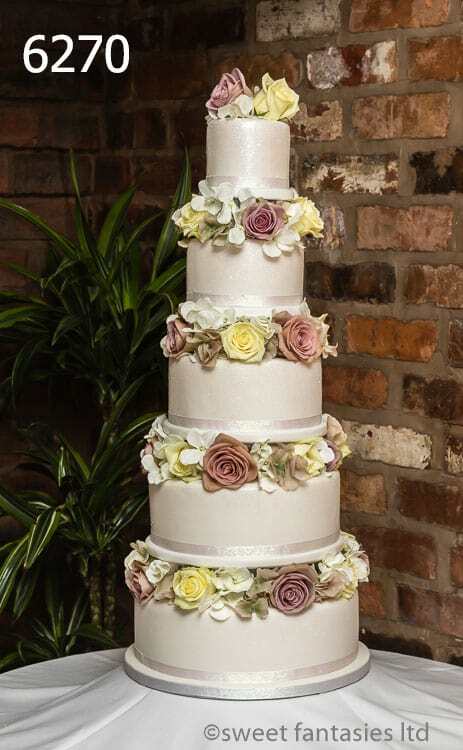 Cake Flavours:- Bottom Tier – Lemon Sponge & Vanilla Buttercream, Middle Tier – Chocolate Orange sponge with Vanilla Buttercream, Top Tier Vanilla Sponge, Raspberry Jam & Buttercream. ﻿Final Valley Statues – Hashirama and Madara.